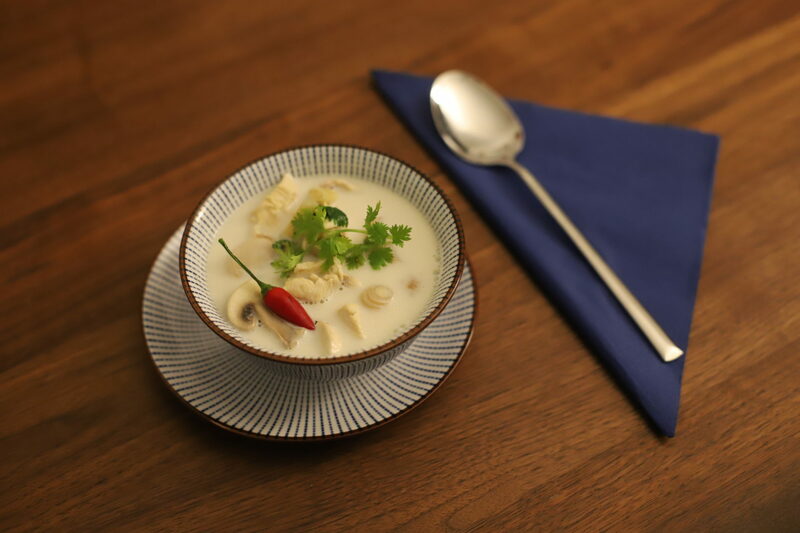 Tom Kha Ghai, or simply a Thai Chicken Coconut Soup is besides Thai cuisine’s amazing curries* one of the main national dishes of Thailand. It’so popular, you will even find it in simple coffee shops within Bangkok’s many shopping malls. 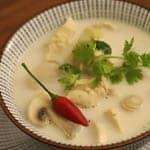 One of the best Tom Kha Gai I had so far, was in such a random coffee shop offering lunch and dinner dishes on the side in case you are hungry after coffee & cake. Sweet & fishy, as it is supposed to be with the delicious aroma of Coconut combined with cooked Chicken. 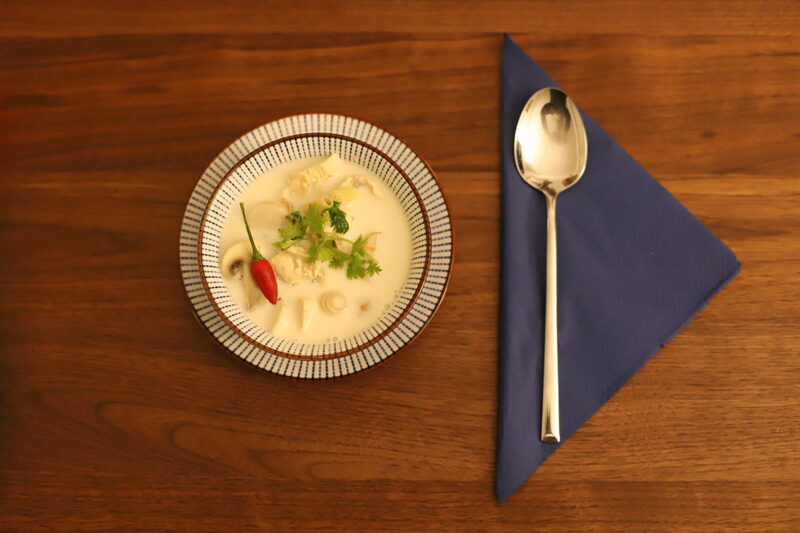 Also, the great Top Thai restaurant I mentioned in my previous post about Thai Green Curry had by far one of the best Tom Kha Gai Soups I had the chance to enjoy so far, but unfortunately this place is not with us no more so we have to help ourselves. 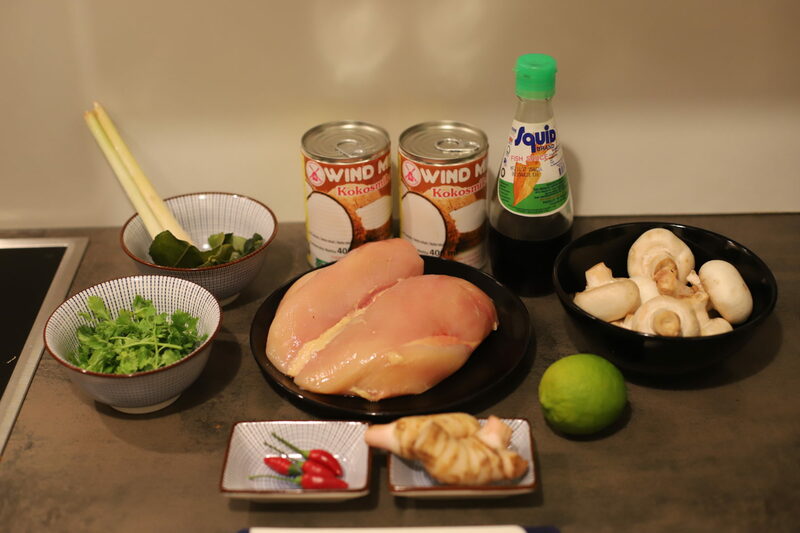 First of all, you will have to go to your trusted Asian or Thai grocery store and stock up with the main ingredients of Thai cuisine, which you will need from now on because this dish is not a one-timer. Please note, that you can store all those ingredients in your freezer, so don’t worry about buying too much. Nothing will go bad if you make sure it’s frozen for later use. The fish sauce can be stored in your fridge, just make sure it’s closed. 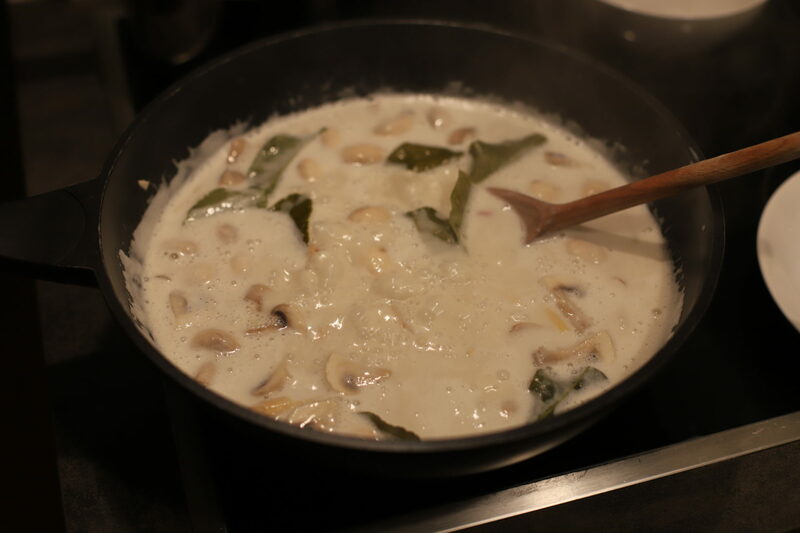 The Tom Kha Ghai, of course, doesn’t need any Thai Basil, but it’s essential for a Green or Red curry. 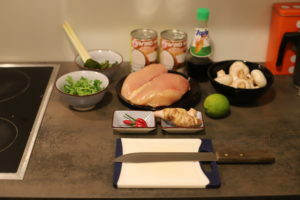 My recipe for Thai Red Curry**. 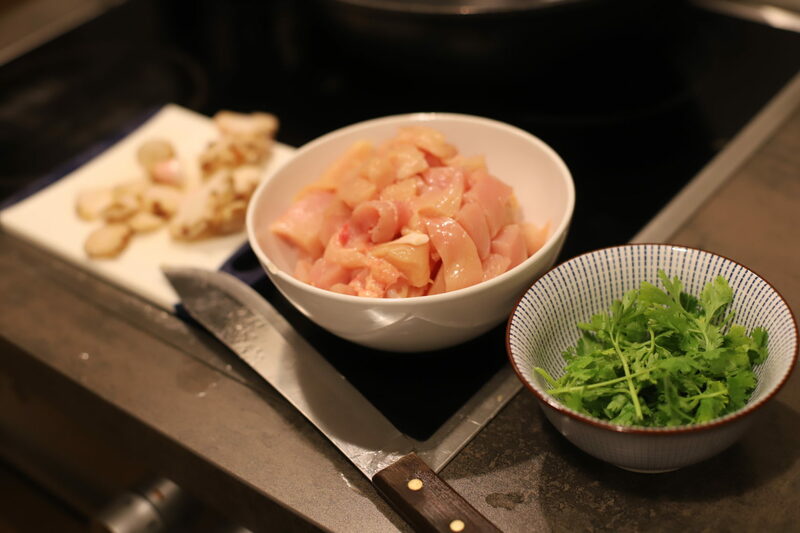 Make sure to get a fresh chicken breast and cut it into thin slices or small cubes. This makes sure you don’t overcook the Chicken and just let it simmer for a few minutes before turning off the heat. I am sure you won’t be disappointed. Feel free to send your opinion and thoughts to the recipe. 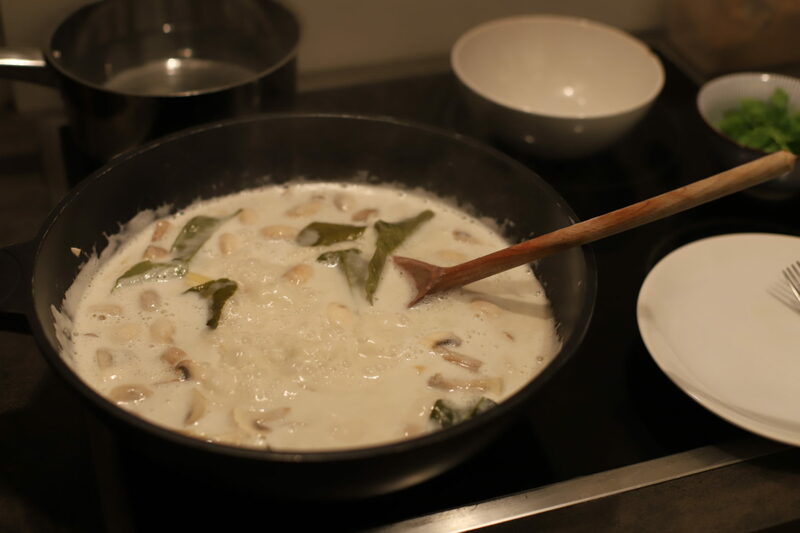 *See also my previous post about Thai Green Curry including the recipe. 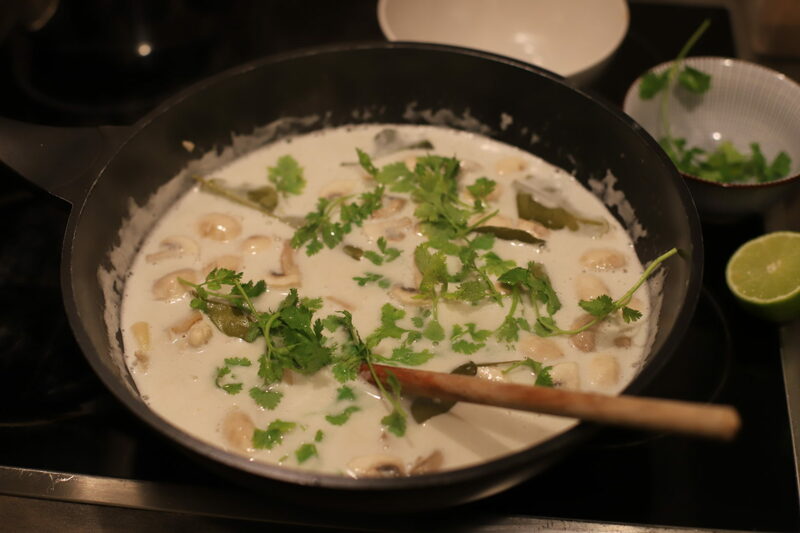 ** My recipe for Thai Red curry is still in the making and soon to come. 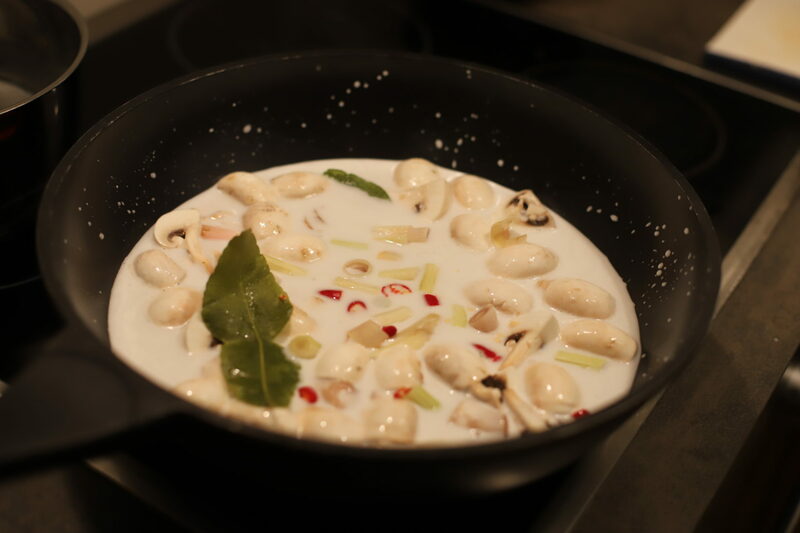 This recipe for Thailand's traditional Tom Kha Gai serves to people. It works well as an appetizer. As a main dish, you can pair it with rice noodles. Cut the mushrooms, chicken, galangal, chilli and the lemon grass. Put all ingredients except for the Chicken breast into a large sauce pan or Wok on a preheated stove. Bring to boil. As soon as it boils lower the heat, let it simmer for 5 minutes. Add the chicken breast and let it simmer on medium heat for 5 minutes. Turn off the heat. Add some lime juice from a fresh lime. Add the cilantro. If needed, also add some more sugar and fish sauce. Mix it well and let it cool down. Serve right away OR let it cool down and warm up a few hours later. Serve with more fresh Cilantro and chilis if needed. Word of advice: Prepare the soup hours before you want to serve it. Let it cool down, warm up again on medium heat until it's hot & serve. 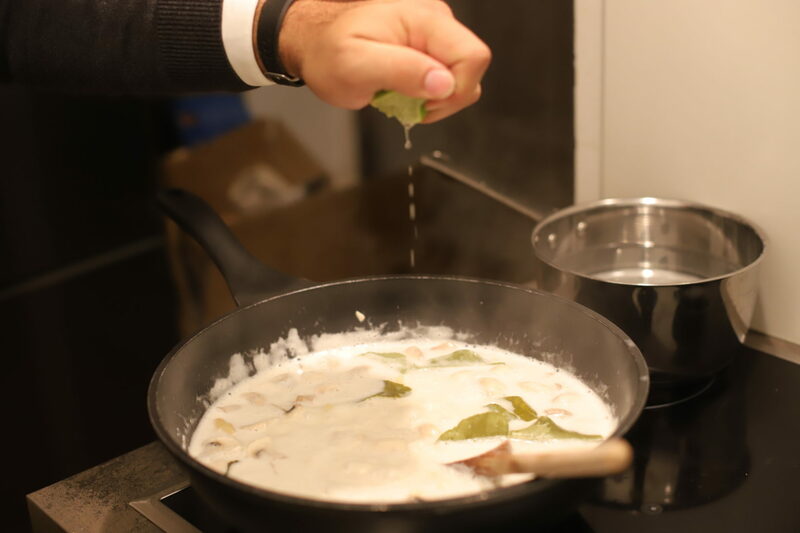 The herbs will have unfolded properly and the taste difference is significant. Use brown sugar and fish sauce generously until the soup is sweet and salty enough. Don't overcook the Chicken. It will be well done after just a few minutes if you have cut the Chicken into thin slices or small cubes.